Posted by Lisa Sabin in fitness, Fitness Goals, healthy lifestyles, nutrition, Weight Loss. Several years ago Emily Edison, a nutritionist friend of mine told me that people who want to lose weight shouldn’t drink diet soda. I referred clients who needed help creating realistic weight loss plans to her. I worked with a man who was an ex-college football player, who drank at least 2 liters of diet soda a day. He weighed 319 when we started working together. I referred him to Emily, who immediately got him off soda. He trained 4 days a week, walking on the treadmill or outside and lifted very light weights with me. Over the course of about 2 months, he dropped down to 289 lbs. Cutting out soda wasn’t the only modification he made. He also cut back on alcohol and reduced his portion sizes. The most common fitness goal and probably the most important is achieving and maintaining a healthy body-weight. Recent data indicates that approximately 66 percent of the United States adults are overweight (defined as having a Body Mass Index of 25 kg/m2 or higher) and 32 percent are obese (defined as having a Body Mass Index of 30 kg/m2 of higher). Type 2 diabetes, hypertension, sleep apnea, osteoarthritis, dyslipidemia, metabolic syndrome and depression are just a few of the diseases that are related to obesity. Posted by Lisa Sabin in fitness, healthy lifestyles, nutrition. Protein is an important ingredient in every athlete‘s diet. Protein has a variety of uses in the body. Minimal amounts of protein are utilized in aerobic exercise. However protein is essential for repairing and rebuilding muscle tissue. It is also necessary for enzyme and hormone function and for the immune system. Posted by Lisa Sabin in fitness, nutrition, running. With all the carb free diets out there, it’s easy for runners and other athletes to fall into the trap of not getting enough carbohydrates in their diet to support their level of exercise. Posted by Lisa Sabin in healthy lifestyles, Healthy Recipes, nutrition. I am on a new kick. I’ve been buying these presliced sweet potatoes at Trader Joes or Costco. I roast them in the oven with olive oil and sea salt and pepper…..
Posted by Lisa Sabin in healthy lifestyles, nutrition, Weight Loss. Oats are high in soluable fiber. What that means is that oatmeal acts like a sponge which absorbs cholesterol and removes it from your system. 3 grams of fiber has been shown to reduce cholesterol, specifically LDL, which is low density cholesterol. This equates to about 1 1/2 cups of oatmeal a day. RDA recommends 5-10 grams of soluable fiber every day. 20-35 grams total. I love salads and I love edamame. I am always looking for something healthy and easy to make. I was excited when I found this simple recipe from Self Magazine. Yum! Drizzle olive oil onto ears of corn, sprinkle with sea salt and freshly ground pepper. Roast corn at 350 degrees for about 40 minutes. Turn frequently. Toss edamame, peppers, onions, cilantro in bowl. Whisk lemon and light mayo in a cup, toss into the salad. Set aside. Remove corn from oven, let cool for a few minutes. Carefully cut corn kernels off the cob. 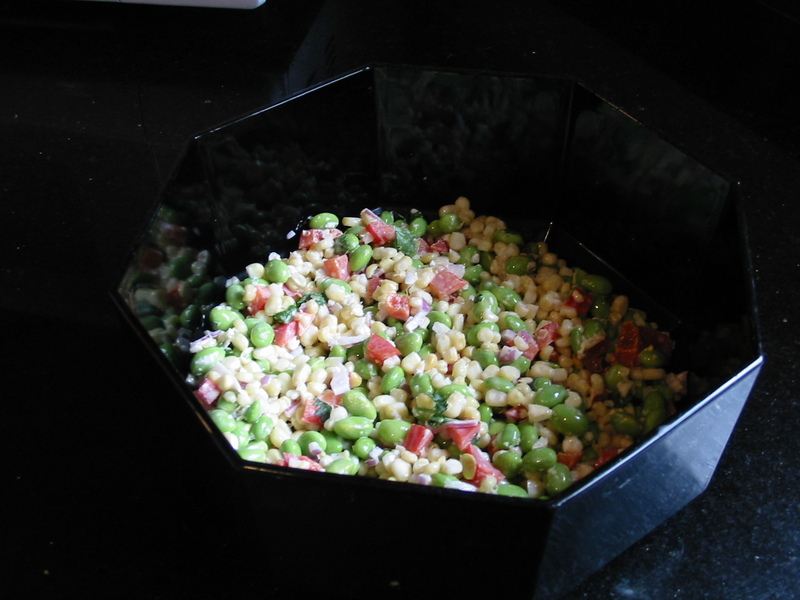 Toss corn into the bown with the other ingredients. Chill in the refrigerator. Posted by Lisa Sabin in fitness, Fitness and Travel, Fitness Goals, healthy lifestyles, nutrition, Travel Workouts, Working Out and Traveling. I was in Garden Grove, CA from Tuesday through Sunday last week. I had a business conference that lasted 5 days. We started early at 8:55am and continued until 10 or 11pm at night, every night. We broke for lunch and dinner, but only for an hour or 1:15 at the most. I brought my work out clothes and hoped that I would be able to squeeze in a few work outs. I checked into my room and headed to the gym. I wanted to get a work out in before we had our first meeting on Tuesday. The Hyatt in Orange County has an amazing gym. There were 3 treadmills, 5 elliptical trainers, a stairmaster and 3 or 4 bikes. They also had medicine balls, swiss balls, a bosu ball and free weights. The gym was open from 5am – 10pm. I ran on the treadmill, even though I prefer running outside, because I wasn’t familiar with the area. I got up on Wednesday morning and hit the gym around 6 am. I was astounded to find every peice of equipment occupied. I was able to get in some cycling, a little running and some strength training. I was excited to see so many people making fitness a priority. My goal was to take care of my health even though I was working long hours. I decided to workout 5 times over the course of the week, eat a piece of fruit every day, skip alcohol and drink more water. I had met a runner/trainer who was also from Seattle, on the shuttle from the airport on Tuesday. I ran into him again on Wednesday and scheduled a run for the following morning at 6:15 am. We lucked out with the weather, it was around 50 degrees in the morning and warmed to around 70 – 74 in the afternoon. We ran down to Disneyland and back, about 45 minutes. We rewarded ourselves with Starbucks and stretching by the pool. I was able to get in another strength training work out and I finished the week with a long run on Sunday. A lot of my clients have trouble maintaining fitness when they are traveling. I know it’s tough when meetings go late. It helps if you go into the week with a plan to get some exercise. I returned last night and I feel like my fitness is still on track. This is a good thing because I will be wearing a swim suit in Hawaii on Friday, this week! Posted by Lisa Sabin in Fitness Goals, healthy lifestyles, hydration, nutrition, Weight Loss. I think about what I eat every day and try to eat heathy grains, lowfat dairy products, lean meats etc. I try to avoid sodium. The RDA recommends keeping sodium intake below 2,000 mg per day. It’s amazing how much sodium is in everything! I will weigh a few pounds more the day after eating out or having pizza. It’s a challenge to keep it all in balance. I am trying to get a little leaner and still have energy to work out and maintain my busy lifestyle. I was reading a case study in CompetitorNW The article is about Sean, a 27 year old competitive swimmer who started gaining weight after he quit competing. As a law student his schedule is busy, despite this he still manages to get in some swimming, rock climbing and cycling. His goals are to maximize energy levels and encourage fat loss and enhance performance. Isn’t this what we all want? Kim Mueller, MS, RD, Sports Nutritionist noticed that Sean’s calorie intake was too low. (1,635 calories) His carbohydrate intake was too low as well as his protein intake. This would explain low energy levels and poor recovery from work outs. Calorie and carbohydrate restriction can lower the amount of glycogen stored within the muscles and liver, which can lead to reduced power output and decreased endurance capacity. High protein, low carb diets have this same effect. It’s like putting the wrong kind of fuel in the engine. Sean’s other problem was too many calories at the end of the day. Instead of eating 3 larger meals, it’s better to eat 4-6 smaller meals through out the day. Increase calories to 2100, focusing on adding more carbohydrates to help him recover from his work outs. At the end of 12 weeks Sean lost 10 lbs, and increased his lean body mass by 3 pounds, which equates to a 7% increase in metabolic efficeincy. I read this article and started analyzing my diet. My calorie intake is not bad. I am in a recovery cycle right now, which means I am not burning as many calories. I notice that I am tired sometimes and that I come up short in the fiber department. I am not much of a fruit eater. I also need to drink more water. New diet goal: Add 2 fruits per day. Drink more water. Try not to go over 5 hours with out eating something. Posted by Lisa Sabin in boston marathon, Fat Tuesday, nutrition, Weight Loss. I woke up this morning and found 6 boxes of girlscout cookies on the dining room table. They weren’t there when I went to bed! A friend of ours has two daughters who are girlscouts. Apparently, Phil didn’t know about my pact with my sister to give up sweets for lent! Either that or he just couldn’t resist a couple of cute kids. They are in our freezer right now, out of sight, out of mind right? I feel like the guy in the movie “What It Takes.” He doesn’t keep any food in the house, so he won’t cheat. The cookies are calling me! Should I keep my word? or support the scouts?